Figure 1. Automatic stabilizers, like welfare programs such as food stamps, automatically kick in when aggregate demand falls. Fiscal policies include discretionary fiscal policy and automatic stabilizers. Discretionary fiscal policy occurs when the Federal government passes a new law to explicitly change tax rates or spending levels. The stimulus package of 2009 is an example. Changes in tax and spending levels can also occur automatically through non-discretionary spending, due to automatic stabilizers, which are programs that are already in place, and thus do not require Congress to act. Instead, they prevent aggregate demand from falling as much as it otherwise would in recession, or they hold down aggregate demand in a potentially inflationary boom. Let’s see how this works. Automatic stabilizers include unemployment insurance, food stamps, and the personal and corporate income tax. Suppose aggregate demand were to fall sharply so that a recession occurred. The lower level of aggregate demand and higher unemployment will tend to pull down personal incomes and corporate profits, which would tend to reduce consumer and investment spending, further cutting aggregate demand and GDP. Consider, though, the effects of automatic stabilizers. 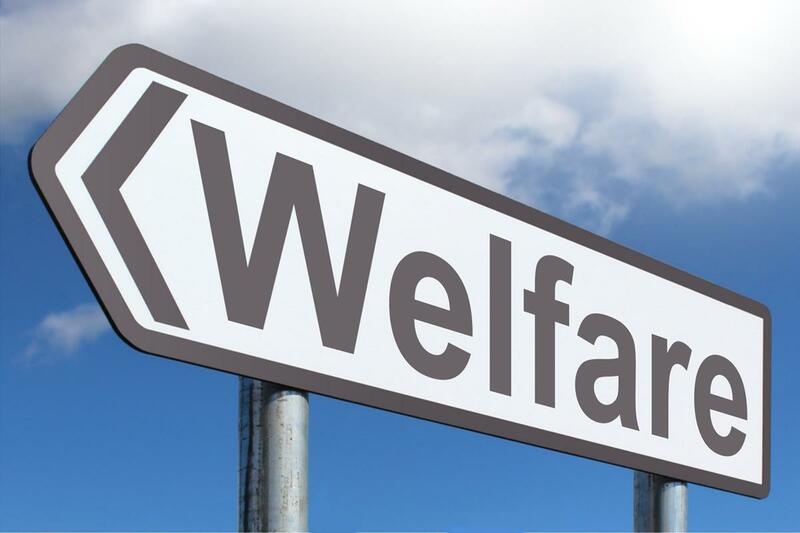 As individuals are laid-off, they qualify for unemployment compensation, food stamps and other welfare programs. Additionally, since their income has fallen, so have their tax liabilities. All of these things serve to buoy aggregate demand and prevent it from falling as far as it otherwise would. Thus, recessions are somewhat milder. The process works in reverse, too. Consider the situation where aggregate demand has risen sharply, causing the macro equilibrium to occur at a level of output above potential GDP. Because taxes are based on personal income and corporate profits, a rise in aggregate demand automatically increases tax payments, reducing disposable income and thus spending. On the spending side, stronger aggregate demand typically means lower unemployment, so there is less need for government spending on unemployment benefits, welfare, Medicaid, and other programs in the social safety net. The combination of these automatic stabilizing effects is to prevent aggregate demand from rising as high as it otherwise would, so that inflationary pressure is dampened. A glance back at economic history provides a second illustration of the power of automatic stabilizers. Remember that the length of economic upswings between recessions has become longer in the U.S. economy in recent decades. The three longest economic booms of the twentieth century happened in the 1960s, the 1980s, and the 1991–2001 time period. One reason why the economy has tipped into recession less frequently in recent decades is that the size of government spending and taxes has increased in the second half of the twentieth century. Thus, the automatic stabilizing effects from spending and taxes are now larger than they were in the first half of the twentieth century. Around 1900, for example, federal spending was only about 2% of GDP. In 1929, just before the Great Depression hit, government spending was still just 4% of GDP. In those earlier times, the smaller size of government made automatic stabilizers far less powerful than in the last few decades, when government spending often hovers at 20% of GDP or more. This video briefly explains the difference between automatic stabilizers and discretionary government spending. From the previous section, it should be clear that the budget deficit or surplus responds to the state of the economy. That is, the automatic stabilizers cause the budget to go into deficit (higher spending and lower tax revenues) during recessions and to go into surplus (lower spending and higher tax revenues) during booms. As a result, we can’t look at the deficit figures alone to see how aggressive fiscal policy is. Each year, the nonpartisan Congressional Budget Office (CBO) calculates the standardized (or full) employment budget—that is, what the budget deficit or surplus would be if the economy were producing at potential GDP. Since the automatic stabilizers are “in neutral” at potential GDP, neither boosting nor dampening aggregate demand, the standardized employment budget calculation removes the impact of the automatic stabilizers on the budget balance. Figure 2 compares the actual budget deficits of recent decades with the CBO’s standardized deficit. Figure 2. Comparison of Actual Budget Deficits with the Standardized Employment Deficit. When the economy is in recession, the standardized employment budget deficit is less than the actual budget deficit because the economy is below potential GDP, and the automatic stabilizers are reducing taxes and increasing spending. When the economy is performing extremely well, the standardized employment deficit (or surplus) is higher than the actual budget deficit (or surplus) because the economy is producing about potential GDP, so the automatic stabilizers are increasing taxes and reducing the need for government spending. (Sources: Actual and Cyclically Adjusted Budget Surpluses/Deficits, http://www.cbo.gov/publication/42323; and Economic Report of the President, Table B-1, http://www.gpo.gov/fdsys/pkg/ERP-2013/content-detail.html). Automatic stabilizers respond to changes in the economy quickly. Lower wages means that a lower amount of taxes is withheld from paychecks right away. Higher unemployment or poverty means that government spending in those areas rises as quickly as people apply for benefits. However, while the automatic stabilizers offset part of the shifts in aggregate demand, they do not offset all or even most of it. Historically, automatic stabilizers on the tax and spending side offset about 10% of any initial movement in the level of output. This offset may not seem enormous, but it is still useful. Automatic stabilizers, like shock absorbers in a car, can be useful if they reduce the impact of the worst bumps, even if they do not eliminate the bumps altogether.